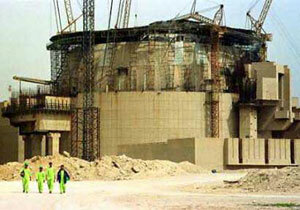 Nuclear reactor in southwest Iran under construction in 2003. Washington and its allies oppose Irans development of nuclear technology, which Tehran says it needs to provide power. Washington is making new threats to pressure Iran to abandon its development of nuclear power. The imperialist campaign came as divisions widened among the Iranian rulers and armed forces with the resumption of protests for democratic rights. Washington has charged that Irans nuclear power program is aimed at producing weapons. Tehran denies this, saying the program is needed to develop the countrys infrastructure. Mrs. Clintons invocation of a defense umbrella is reminiscent of the so-called umbrella that Washington extends to its Asian allies: implicitly, the promise of an American reprisal if they are attacked by nuclear weapons, the New York Times said July 23. I think were in full agreement [with Tel Aviv] on the negative consequences of Iran obtaining [nuclear] capability, Gates said. The Obama administration has proposed to Tehran that it engage in negotiations over its nuclear program. At the news conference Gates demanded an answer from the Iranian government by late September, when the United Nations General Assembly convenes. If the engagement process is not sufficient the U.S. is prepared to press for significant additional sanctions, he warned. The White House has also stated that military action is not ruled out. In Iran tens of thousands of young people were back on the streets of Tehran July 17. Their demonstrations to win more rights and political space have taken the form of supporting the campaign of Mir Hossein Mousavi, a former prime minister who ran for president in the June 12 election. His backers charged fraud when the government announced President Mahmoud Ahmadinejad had won the election. In the first large protest since some 20 protesters were killed in June by government forces, tens of thousands of Mousavi supporters turned out to hear Hashemi Rafsanjani, a former president who backed Mousavi in the election, address the Friday prayer meeting. Attendance at the Friday prayer is usually dominated by government supporters. In his speech Rafsanjani stated that Iran faces a crisis and that it is necessary to regain peoples consent and restore their trust in the regime. He called for releasing those imprisoned during the protests. The next day Supreme Leader Ali Khamenei, the countrys most powerful political figure, appointed a new head of the armys political ideology section. Khamenei sent Ahmadinejad a letter demanding he cancel Mashaies appointment. Three members of the cabinet walked out of a meeting July 22 when the president refused to let Mashaie go. Hundreds of conservative students who generally back Ahmadinejad demonstrated against him in Tehran July 24. Mashaie resigned that same day. On July 25 Ahmadinejad fired his intelligence minister, who had been among the critics of Mashies appointment. The minister of culture, also an opponent of the appointment, resigned July 26.